Here is little Liam from the Devore shelter, confiscated from his owners by Animal control. He was a rescue only pull and it was originally thought his right eye had an ulcer. Upon further examination, his eye suffered a trauma and his vision is permanently lost in that eye. Our ophtalmologist Dr Fahrer saw him today to decide what the best course would be. He has glaucoma in that eye, his pressure is elevated and since his vision is permanently lost, the decision was made to remove his right eye. The good news is that his left eye is perfectly healthy and his future looks bright. He is currently being taken care of by Dr Galea and his team and will have his surgery this week. THIS IS A CASE OF ABUSE, in the most brutal, inhumane way. This poor little boy clearly suffered unimaginable pain at the hands of his former owners. His body is covered with scars old and new, he was starved and is struggling to gain weight. 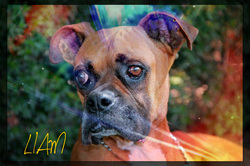 Of course, as is often the case with dogs used for bait in dog fights or abused, Liam is the sweetest, most loving boxer. He doesn't hold a grudge towards humans and only wants to curl up against you and be petted and loved. He gets along with other dogs and we are hoping a foster home will open up who could bring this special soul back to health after his surgery. I don't know if the Devore shelter is pursuing charges against his original owners, I hope they do but once again, my faith in humans is at its lowest.